Now luxuriously renovated in beautiful contemporary style, this house was originally The Station Master's House and booking office. 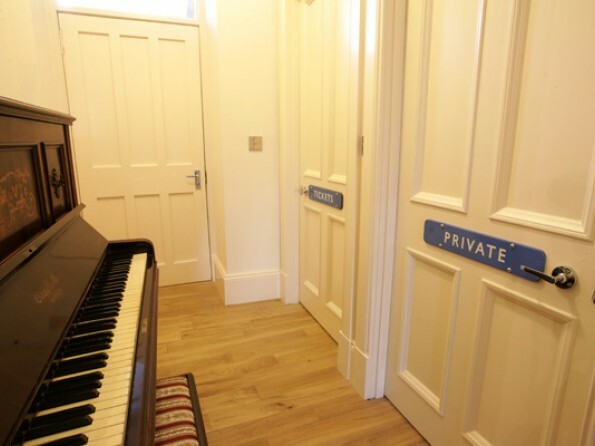 With blue enamel signs on the doors, original carriage prints on the walls and railway memorabilia scattered around the house, the building’s unique heritage is evident throughout. Sanquhar Station has been restored to its former glory and turned into a current, comfortable and well-appointed holiday retreat. Great care has been taken to retain character, and little touches like old railway posters and porters’ trolleys really do hark back to the good old days. The house is set in an area of breath-taking natural beauty where you can fish, kayak, hike, cycle and golf to your heart’s content, and this is the perfect base in which to relax and unwind after a day of sightseeing and fresh air. The house has now been awarded the five-star rating for self-catering accommodation from the Scottish Tourist Board, but it is hard to describe it and do it justice, so you’ll just have to come and see for yourself. A stay in a railway station is a truly unique experience! Sanquhar is in the Upper Nithsdale Valley in the Dumfries and Galloway region of Southern Scotland, and it is an ideal base for all sorts of activities. You can fish at Ryehill Farm, mountain bike along the 7 Stanes route, play golf at Thornhill or explore the walking routes of the Southern Upland Way. Nearby is picturesque Galloway Forest Park, the bustling market town of Dumfries, and majestic Drumlanrig Castle, not to mention the New Lanark World Heritage Site and the Leadhills and Wanlockhead Railway, an essential day out for industrial heritage enthusiasts. Alternatively you could visit the scenic coastline, experience the shops and theatres of Glasgow and Edinburgh or spend an evening with our local Michelin-starred chef at Blackaddie Country House Hotel. You could explore the region by rail on one of the trains that stop at Sanquhar Station each day, head for Carlisle and Hadrian’s Wall, or visit pretty, artistic Kirkcudbright on the coast. The possibilities are endless! Unsurprisingly, you can access your train station holiday by train. By rail, there are regular, direct train services to Sanquhar Station from Glasgow Central, Newcastle and Carlisle. By road, Sanquhar is located on the A76, 15 miles West of the M74, 25 miles North West of Dumfries, and 53 miles South of Glasgow. Via the Stranraer Ferry, Sanquhar Station can be reached within a couple of hours’ drive. You might think a stay in a train station would lack luxury, but that couldn't be further from the truth here. 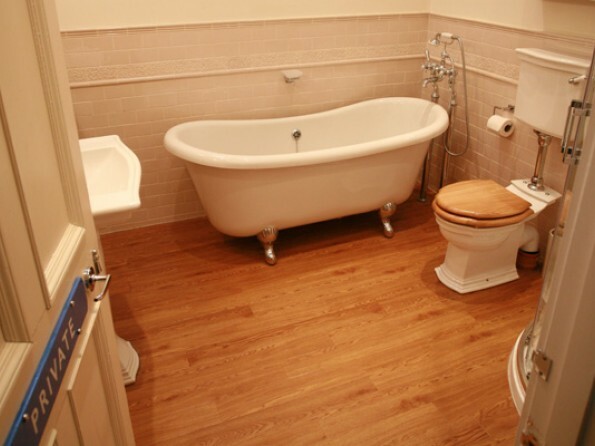 The house has three lovely bedrooms (two king size and one twin/double) and three bathrooms, one en-suite with the master bedroom, one family bathroom with a roll top bath, and one WC/shower room. There is a modern well-equipped kitchen with granite worktops and a dishwasher, a stone-flagged dining room created from the Station’s light, airy waiting space, and a utility room with a boiler and drying rack. There is also a cosy living room with a log burner, hardwood floors and a plasma TV, as well as a DVD player and plenty of books, magazines and board games. The single-level layout of the building and the wider-than-normal doorways make the house ideal for those with disabilities. house has a south west facing lawn & patio with a large hardwood table & 6 chairs, private parking for 2 cars, plus a garage. The house enjoys a quiet, peaceful location, just off the cul-de-sac of Station Road, Sanquhar. We purchased Sanquhar Station in 2008 and began the renovations at the beginning of 2010. We sourced reclaimed doors up in Paisley near Glasgow, we replaced the traditional stone flags in the waiting room with stone from Burnley in Lancashire, and we’re still finding railway treasures at specialist auctions to add to the character of the building. We have tried to make the most of the building’s heritage by putting railway prints on the walls and collectables like weighing scales around the house. Deposit for your train station holiday is payable on booking.